An engagement ring is one of the most important purchases you will ever make. Where do you begin? With your budget? By choosing a diamond? What if you have an heirloom diamond you want to include in the engagement ring you choose? All of these questions, and any others you have on your mind, are worthy of time and consideration when buying her engagement ring. If you ended up here you are looking for some answers. We invite you to spend a bit of time with us, on our blog, where we have put together some advice in The Coast Diamond Men’s Guide to Buying an Engagement Ring: Style. We have three ways for you to discover her style before you start shopping. What’s her lifestyle? Her job or a hobby she likes can give you clues on the engagement ring style and profile she might prefer. If she’s busy and uses her hands a lot, she might prefer a lower profile halo engagement ring, like the one pictured above. If she’s has a glamorous job and always dresses to the nines, a pear shaped diamond center stone is totally her. Check out her Pinterest board. It’s the best place to find all the things she loves. Girls talk. You should talk to her friends to get some ideas. Her mom. Her sister. They can give you a few hints too. Her dad might be a good ally to help you stay within budget while choosing a ring she loves. Risks: If you want it to be a surprise you obviously don’t want to include her. Benefits: It is more and more common for couples to shop together for an engagement ring. If you know she would love dreaming with you while browsing at the jewelry store and trying on a few engagement rings, it can help you both learn more about engagement ring possibilities. Don’t buy her engagement ring right then and there, go back to buy it, so the one you choose is a surprise for her during the proposal. There is a lot to think about when it comes to engagement ring style. But if you have done your homework above, you are ready to scroll through and narrow it down. The Coast Diamond Vintage Collection has all the qualities of old world craftsmanship: hand engraved platinum settings, pavé diamonds and milgrain edging. A vintage inspired engagement ring suits your bride-to-be if she loves everything sparkle, or maybe her friends describe her as retro. And let’s face it… vintage never really goes out of style. A princess cut diamond center stone can turn a classic ring, modern. Princess cut stones have lots of sparkle in its geometric shape. Sophistication at its best. It’s not called princess for nothing. A classic diamond ring is simple and carries the hallmarks of an heirloom to be passed down for generations. The emphasis is often on a gorgeous diamond center stone that may be accented by diamonds falling down the shoulders of the ring. A bold engagement ring means a lot of sparkle. A halo of diamonds around her center stone adds size and sparkle. An ornate diamond encrusted band not only adds to the beauty of the ring, but holds a large ring snugly on her finger. Engagement ring trends for today are focused on the center stone. The pear shaped center stone is hot. Colored gemstones are popular too. Colored gemstones (either as a center stone or accent stones) are a wonderful way to stay classic but add personality. Our Coast Diamond Signature Color Collection is one-of-a-kind precious colored gemstones set in platinum. Choose her favorite color or her birthstone. The metal of choice for the moment is rose gold. It’s a trend that is not going away any time soon. A classic choice is platinum. Or be creative and mix metals. The round center stone is the most popular center stone shape. Pear is a trending stone and oval looks especially pretty on small hands to elongate the fingers. But you have lots of options: round, princess, pear, oval, heart, marquise… The image below shows a Coast Diamond halo engagement ring created for an oval, princess and round diamond center stone. Many of our Coast designs can be created to fit any size center stone you choose. This is especially important when you have an heirloom diamond you are looking forward to putting into your engagement ring design. The Coast ring below (LC10072) is shown in one carat on the left and two carats on the right. 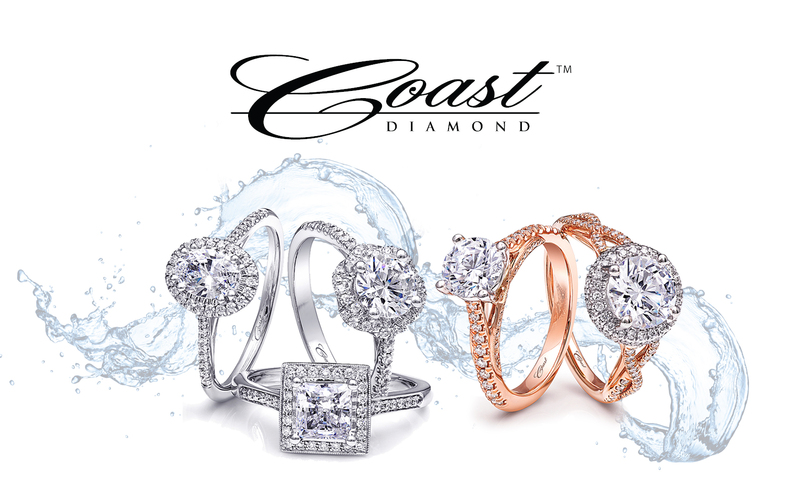 Coast Diamond is known for its beautifully crafted engagement rings. From pretty and delicate to bold and dazzling, there is a Coast Diamond ring for every bride-to-be to fall in love with. Follow our series The Coast Diamond Men’s Guide to Buying an Engagement Ring on our blog page at our Coast website. Next week we’ll talk about what gives you the most confidence in your engagement ring purchase… Value. Share your Coast engagement ring story with us at #showyourcoast!